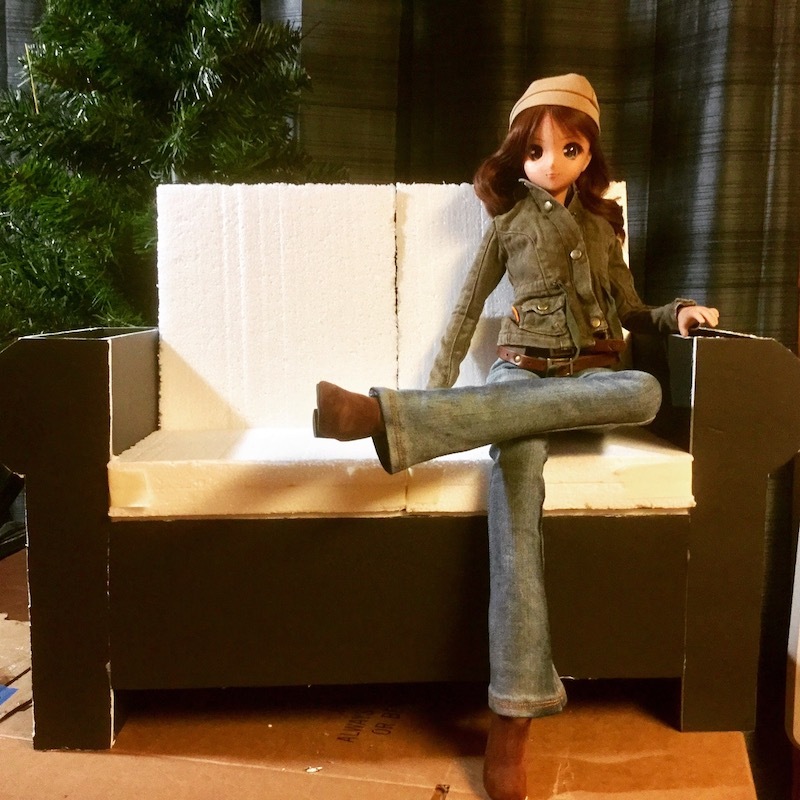 Most of these photos have appeared in one topic or another on the forum, but here I've combined all my Work-in-Progress pics into a quasi-tutorial on constructing a sofa and a chair in Smart Doll scale. I recently purchased my first 1/3 scale Smart Doll, which quickly became two Smart Dolls. I figured they needed a place to sit, so I decided to try to construct a sofa in Smart Doll scale. I had no idea what the dimensions should be, so I started by measuring the full-size sofa in my living room and doing the math (divide all the measurements by three, pretty simple) to get an approximate size. That "approximate size" was going to be unfeasibly large, so I opted to try to make a two-seat settee rather than a full-length sofa. 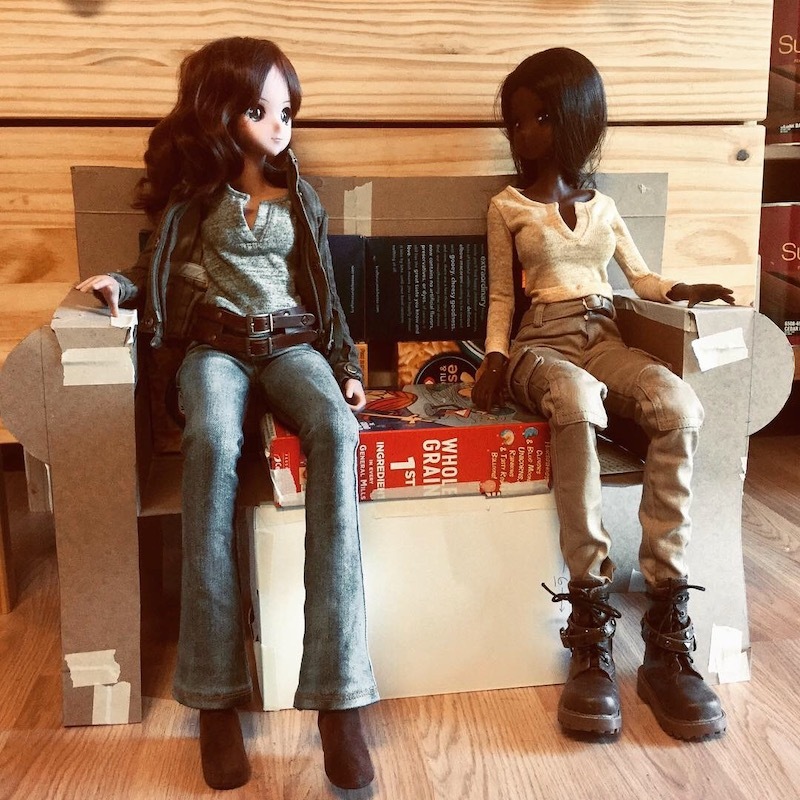 Smart Dolls have longer legs and a slimmer build than actual humans, and while they are well articulated by doll standards, they're still not as flexible as real people, so some adjustments needed to be made to the dimensions to better fit the Smart Doll. Mostly this meant raising the height of the seat relative to the floor to compensate for the long legs of the doll. I ex-perimented by taping together "cushions" made of cardboard. Once I had the dimensions more or less figured out, I used the cardboard pieces from the mock-up as patterns to make a sturdier frame out of foamcore board. The width of the seating area (side to side) is 16 inches. Total width of the piece is about 20 inches. Seat height above the floor is 8 inches to the tops of the cushions. Arm height is 11 inches. Total height of the back is 16 inches above the floor, and about 8 inches above the seat cushions. 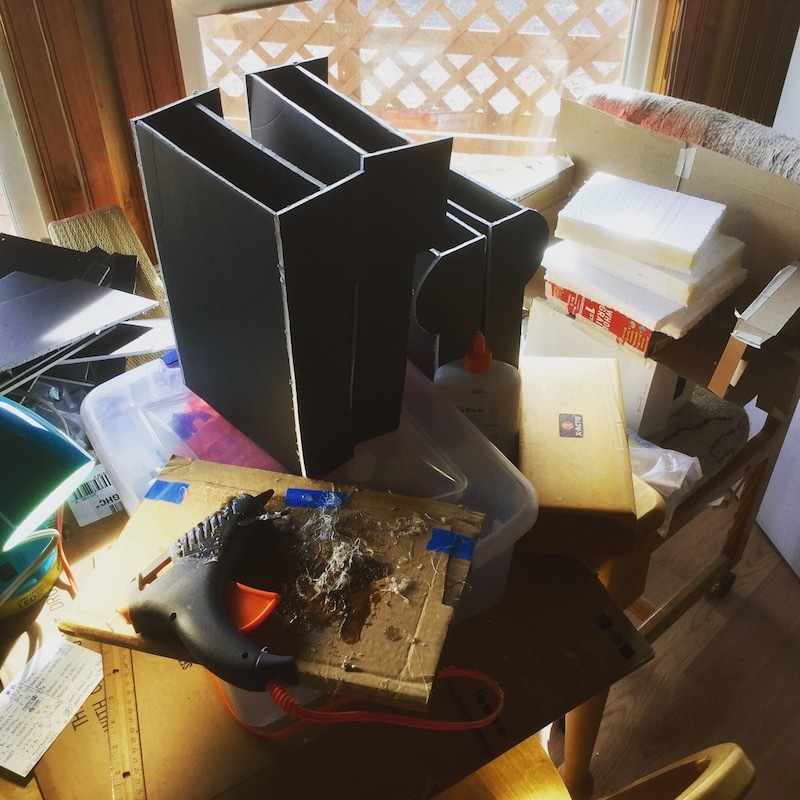 I glued the foamcore frame pieces together using hot-melt glue. The usual burnt fingers and associated swearing ensued. 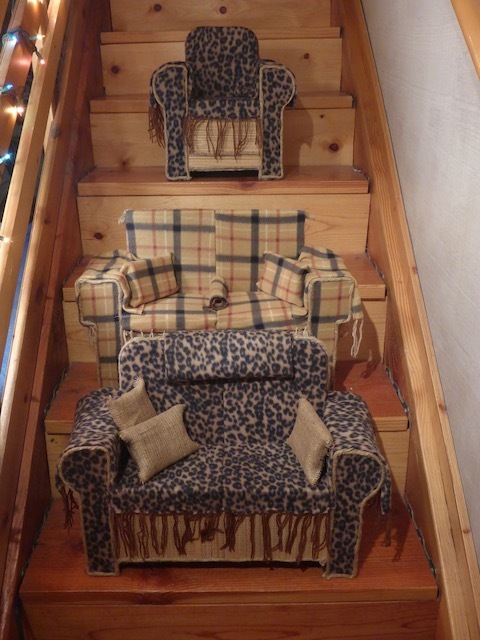 I used pieces of styrofoam for the cushions. The final dimensions were partly based on the thickness of the random bits and pieces of styrofoam I happened to have on hand. And then we get to that big "glossed over" step that plagues most tutorials; you know, the step where something goes from looking like a very rough, cobbled together mess to something pretty cool, with very few specific details offered as to what actually happened. In this case, that step is "cover the frame with fabric." Since I don't sew, the fabric work was done with hot-melt glue and white glue. The fabric is from a scarf I found at a Dollar Store type outlet. It actually required two scarves to cover the sofa arms and cushions. I cut the required shapes out of the fabric and glued the fabric to the foamcore frame and around the styrofoam cushions. I glued on pieces of twine (old macrame jute) to cover the seams. Because I have a penchant for screwing things up, I actually constructed two sofa frames simultaneously. The second one was for when, not if, I messed up the first one. To my surprise, the first attempt turned out fairly well, so I decided to finish the second one. It was only as I was finishing up the second sofa that it occurred to me: Duh! Why do I need two sofas? I should have cut the second one in half and made an armchair, or maybe two armchairs! Rather than disassembling the almost-completed second sofa, I went ahead and constructed an armchair from scratch and covered it with leftover fabric from the sofa. All of the chair dimensions are the same as those of the sofa except for the seat width, which is about 8 inches instead of 16. 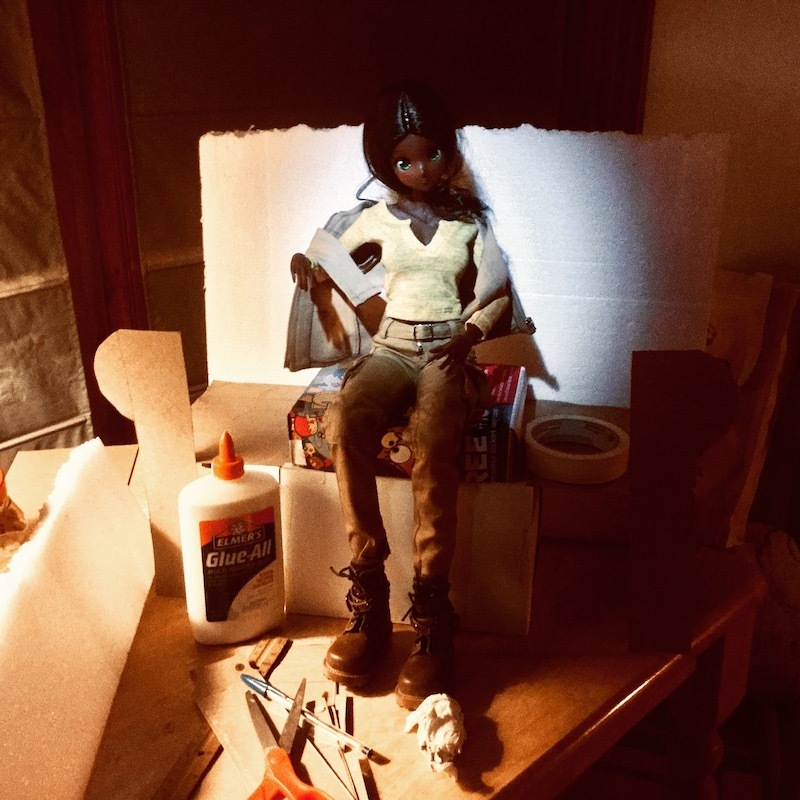 So there ya go: my first attempt at constructing Smart Doll scale furniture out of cardboard, foamcore board, hot-melt glue, masking tape, and cheap fabric. Now the question is, where am I gonna put these enormous things? Just a note: This post looks normal to me and not messy like previous days. Improvement. Update after posting: with an my added response, looks messy again. Sad. OK - those sofas are great and so big! 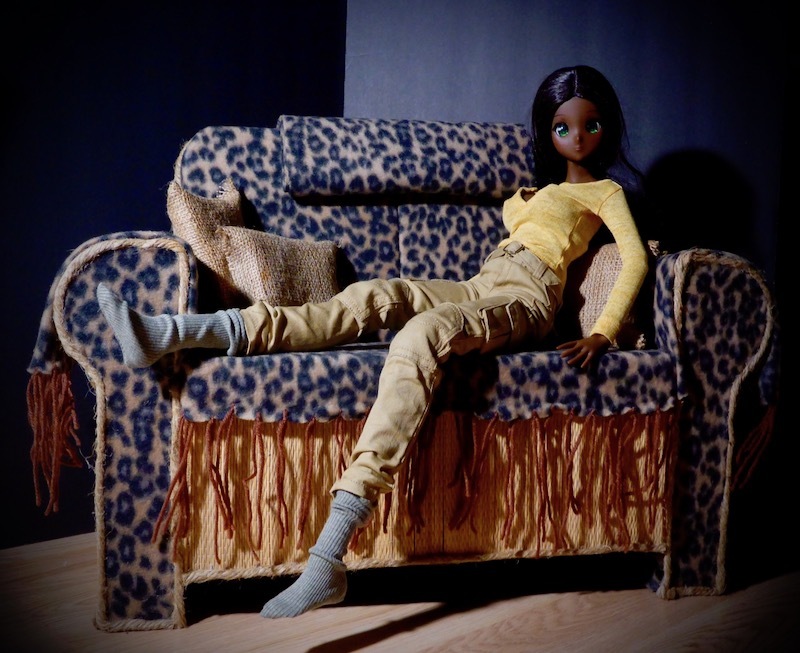 I did not realize that Smart Dolls had such long legs! They look really good -- that's a lot of work! Maybe you'll find yourself in the Smart-Doll-furniture business. "davidd's ddesigner ddecor"? Awesome! I generally lack patience for something that takes this much effort to make. I'd rather sew something. They look amazing! I do not have the patience to do something like this, so am really impressed!